We buried Elijah Rainbow today. 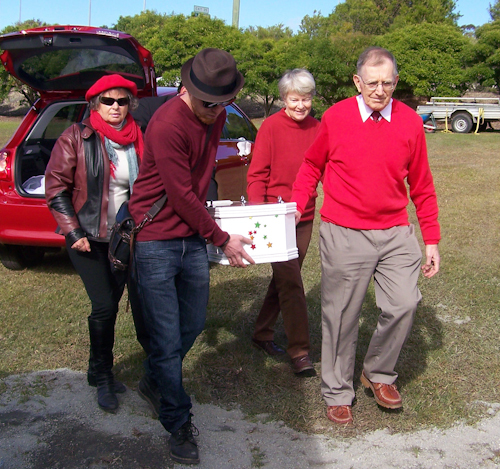 Elijah's coffin is delivered to the burial site in a red car — a beautiful synchronicity that makes me sob. 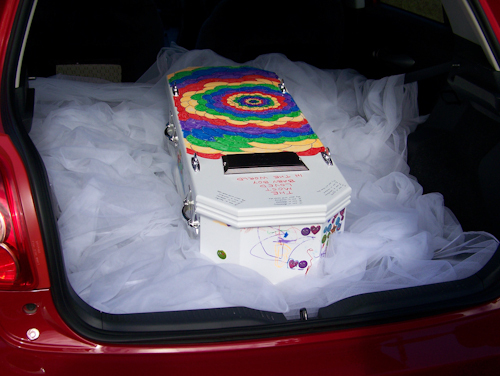 In a private ceremony at the local cemetery, I watched the small coffin holding my only son be lowered into the ground. I was surrounded by family members from both sides of the family plus one dear friend — Ree — who had been the sole bridesmaid at David’s and my wedding almost fifteen years ago. My heart breaks for these people who are burying their grandson and nephew today. The burial is a private affair with only family and my dear friend Ree in attendance. I didn’t have anything planned for the burial, and simply asked my dad to MC the short event. He invited anyone to speak, and we heard words of encouragement and some songs, including my lullaby for Elijah and an original composition by my sister-in-law in London. 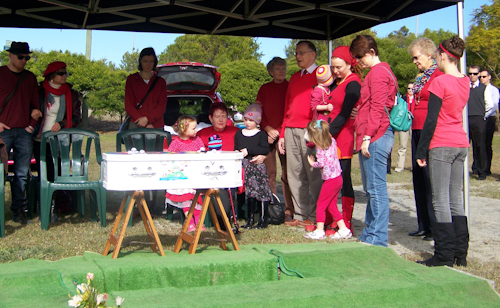 Brioni sang “I can sing a rainbow” along with Aunty Gwenda, and I just stared at the coffin. I am glad to have my father at my side for support at a time like this. I never previously imagined that I would be standing there, saying good-bye to the one I cherished so deeply. It is just so wrong to be watch your child’s body be buried in a small hole. I thought we had a future together! I have boxes of boys’ clothing in larger sizes waiting now in vain. There’s a train-set in storage that I imagined Elijah playing with. I had already started worrying whether Elijah’s girlfriends would be able to connect with me! 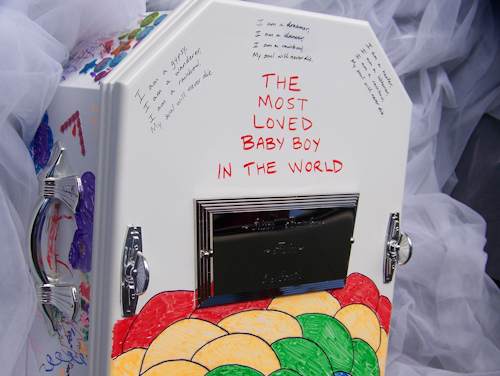 I wrote “THE MOST LOVED BABY BOY IN THE WORLD” on Ellijah’s coffin-lid, for that was his reality. He was an extraordinarily smiley baby as he reflected the love and adoration he received from his family — especially his four sisters. He was the most loved baby boy in the world, I'm certain. Our parenting style with Elijah was different than with our four daughters. We were attachment parents with Elijah where we had been routine-based with the girls. And this means that I am confident I held him enough, cuddled him when he desired closeness, listened to his breathing next to me at night and responded to his simple demands. He was uncircumcised, unimmunised and untainted — allowed to simply be. What a pure existence — I just wish I had known him for longer! Dare I question how such sorrow entered into my life? Yet I know that I must be the calibre of a woman who can withstand this grief and loss, else this experience would not have been given to me. All those years of separating from my parents as I went to boarding school have taught me how to handle the grief that seems overwhelming. The sorrow I felt as a child has been formative in shaping my parenting ethos, and now I can see that the mental skills I perfected at an early age will serve me well at this time. For I have a life to live, and four other lives to guide in a path of love and hope. So I buried my only son today, but our lives continue, and as a smaller family unit, we move into the next phase of our sparkling adventures together. agape LOVE to you Lauren. Sweet precious Lauren. Praying for you as I lift you before the THRONE of GRACE. The lump in my throat is large, the tears in my eyes and down my face are plentiful. No words .. just sorrow as I imagine walking in your shoes that day … all of these days. I’m so sorry for your loss and the painful grief that you are learning to live with hourly, daily, weekly … Always in my thoughts and prayers dear Lauren, you are surrounded by so much love. There’s a traditional wisdom that says; some spirits are so close to purity that they only need a very short time on this Earth to complete their journey. These spirits are born to the people who most need their blessings and love, and who are most suited to aid them in completing their path into the light. We are blessed to have known them. Dear Lauren, I weep with you as I see the photos in this post tonight. How deeply sorry and sad we feel for you all and for the loss of precious Elijah. How gorgeous that you could write on his coffin. So wished you didnt have to. Reading your posts always make me cry. Loved reading about your special life adventures including both you and David and the girls. Seemed such a simple happy life with no worries just love and happiness. As this all unfolded it’s left me thinking all the ‘why’s’ … My heart aches as you deal with the consequence of what was a wonderful man’s actions have on you. Your heart and soul as well as your day to day living and your future. 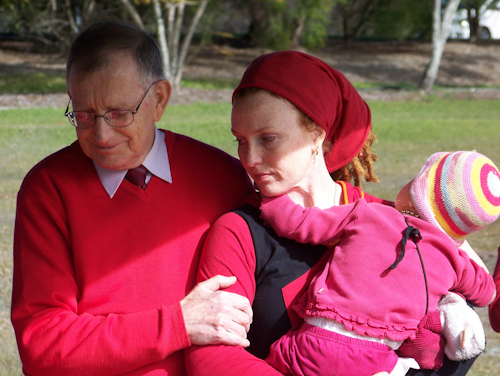 I’m keen to know your feeling on forgiveness as you deal with the loss of your son. I’d also like to reach out to you and the girls in any way I can, be it emotional, financial or somewhere to park the new bus for a while! My thoughts and positive vibes are sent daily! I would like to send you a beautiful long lasting hug and much strength, although I feel you are stronger than you realise. My dear I just stumbled upon this blog and I was just pulled to read Elijah’s story.